DAMASCUS (Sputnik) - Syria is ready to open checkpoints on the border with Iraq, as it sees no security threats, and waits for the neighboring state to solve logistics issues, Syrian Transport Minister Ali Hammoud told Sputnik in an interview. The checkpoints on the Syrian-Iraqi border have been closed since 2014 due to the territory being seized by the Daesh* terrorists. Damascus and Baghdad have discussed the issue of opening the border earlier in October. "During the last visit of Iraqi Foreign Minister [Ibrahim Jaafari] to Syria, one of the main topics discussed was opening the border. The Iraqi side promised that it would be done soon. We are ready as soon as logistics issues are solved on the Iraqi side," the minister said. Syria has been in a state of civil war since 2011, with the government forces fighting against numerous opposition groups and terrorist organizations, whose members flee to the neighboring states as the government forces regain control of the Syrian territory. Ali Hammoud said that he would like to see Aeroflot Russian Airlines become the first foreign carrier to resume air services to Syria. "We believe that the reasons for which this company stopped flights [to Syria] became history. We invite Aeroflot to return to Syria and become the first international company to resume its work here," the minister said. The minister added that it would only be natural that the first foreign carrier to resume air services in Syria should be a Russian one after Moscow helped Syria in fighting terrorism. Aeroflot suspended flights to Syria in 2012. 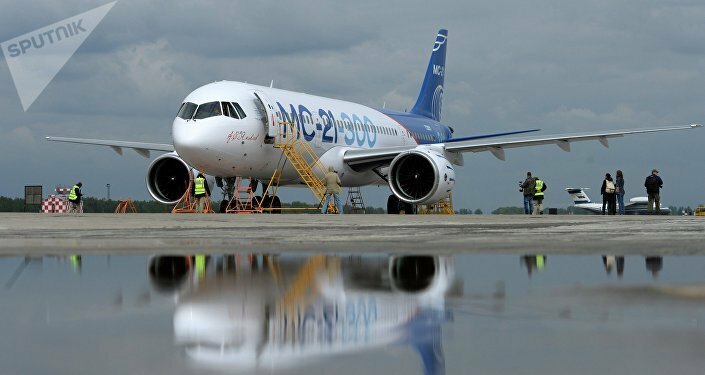 Syria is interested in purchasing Russia's new MC-21 passenger jets and seeks priority in becoming the first buyer, Ali Hammoud said. "We have asked the friendly Russian side so that Syria could have the right of being the first in buying these aircraft," the minister said. According to the minister, Syrian airlines will need more jets when they resume air survives to Europe. The MC-21 jets are developed by the Irkut Corporation. Preparing assembly lines for the serial manufacture of MC-21 is currently underway. The Syrian Ministry of Transport is considering the possibility of expanding the Damascus airport or building a new one in cooperation with Russia, the ministry's head added. "We are cooperating with the Russian side on the issue of expanding the Damascus International Airport or building a new one to replace the current one," Hammoud said, adding that a Syrian analytic company was commissioned to compare the two options, and the most advantageous one would be chosen afterward. Russia will set up in Syria the largest hub on its wheat exports in the Middle East, Ali Hammoud said. "We have reached an agreement with the Russian government on establishing in Syria a center for the exports of Russian wheat to other countries in the region. In this connection, it will be necessary to expand ports in Syria and create granaries in the port area to store large volumes of Russian wheat," the minister said. "That is why we will need a railway and roads, which will be built as part of this large-scale project," the minister said. Adequate infrastructure will be necessary to transport wheat to neighboring states, the minister added.